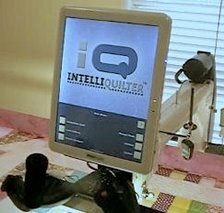 - Divide Pattern makes it easy to quilt a pattern that is larger than your machine's throat depth. You were able to do this by using Split, but Divide Pattern does it simpler. It also allows you to use most closed patterns in Pantograph or Line Pattern. - Upon popular demand, a crosshair cursor was added, selectable in System->Interface Setup/Test. - Another wishlist request was fulfilled by the addition of selective removal of patterns from the queue and clearing the pattern memory in Line Pattern. - A new CAP pattern, Warped Mesh was added. - Now you can convert a pattern to a block point by point, in addition to the contour method. This feature allows operations (e.g. move or edit) on multiple blocks by converting them to patterns, using the multiple pattern editing features, and converting them back to blocks. In addition to these, some more wishlist items were implemented, together with improvements of existing features. Note that this release does not contain StiQ or DesignPad versions, they will be added later. Please update your iQ with the new version and start exploring the new features. As always, your feedback is very important to us, for you are the real designers of the iQ. Using Divide Pattern to create a Pantograph.